Classic City Classic is traditionally the biggest Fall tournament in the Southeast and this year is no exception. While last year’s influx of Nationals level, out of region teams is not repeating in 2016, the Athens tournament should still provide a peek at what the Southeast region will look like this year. The Southeast appears to be a region in a state of flux. UCF demolished their regional foes last season, but the team is looking at a steep drop off for the 2017 campaign after graduating many of their stars and there are a handful of teams who will be looking to take advantage of what should be a more wide open region than we’ve seen in recent years. Without much promise of any teams jumping into the nation’s top tier, the programs that have finished at the top of the region for the last several years are likely to do so again. But if there was a year for one of the non-traditional clubs to make some noise, this would be the one. With plenty up for grabs amongst the top group of teams, CCC represents a perfect opportunity for schools to begin to stratify themselves ahead of the spring season. Here is your primer on the teams that will be playing in Athens this weekend. After making Nationals for the first time in program history in 2015, a huge chunk of the team’s core left the program. What was left of it — Kristin Lloyd, Skylar Taggart, and Lisa Fitton — took the team to a third place finish at Regionals last year, but now they are all gone too. The team will now look to a host of underclassmen and a few remaining veterans to carry the torch for the still young program. 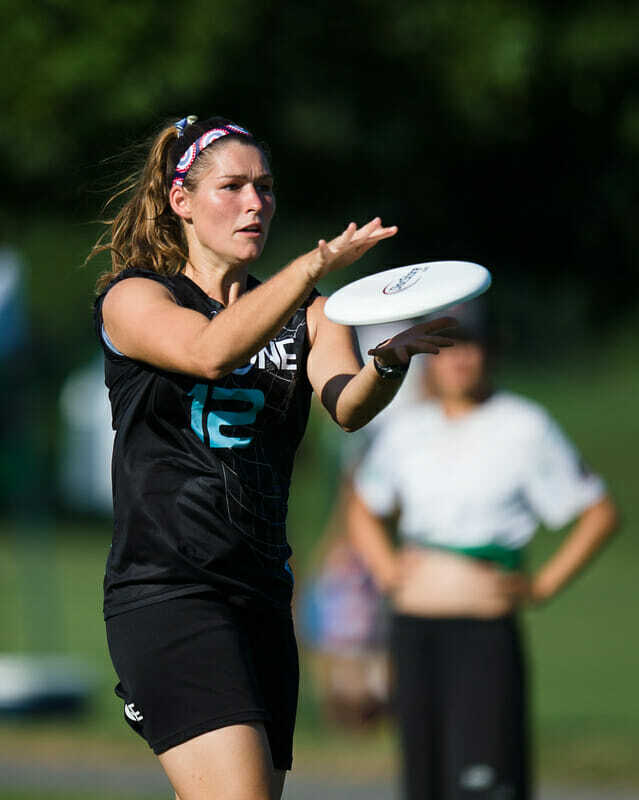 Veteran cutters Connie Barrosso and Julia Gregory provide a nice balance of underneath churner and deep threat but the team will need to rely on a heavily revamped handler corps to get them the disc. Sophomore Lindsi Allman, who spent the summer playing with club team Tabby Rosa, figures to be a significant piece of that thrower group. Last season she showed flashes as a cutter, but coach Josh Boyd is hoping to use her quickness in the handler spot this year. If Allman can develop the way the team hopes, then she should play a big role in how the Seminole Ladies fare this weekend and in the spring. Florida State enters this tournament as the one seed, but that feels a little high for a team that will be reliant on so many young players. FSU could certainly be a factor in the race for number one in the region come the Series, as the team’s athletic youngsters begin to feel more comfortable in leading the team. But CCC will more than likely be a fact-finding mission for them, as well as an opportunity to get some of those young players playing time against the other top teams in the region. Florida comes in as the tournament’s three seed, but perhaps should be favored to win Pool A over the Lady Seminoles. The team brings back a larger number of veterans than their in-state rivals; in the fall, especially, that makes a world of difference. Dynamic duo Tori Taylor (at least for this weekend) and Jaime Estes are gone, but plenty of playmakers remain. Courtney Testa and Danielle Cordes make a formidable pair to lead the team’s cutting options. In fact, the two probably make up the most dangerous cutting twosome in the region right now, at least on paper. Lucy Berman is a spark plug all over the field — a very welcome attribute, considering the amount of kineticism lost with Estes’ graduation — and although most of the team’s handlers are gone from last year, Kelsea LeBeau brings experience and a calm on-field demeanor to the position. The team boasts plenty of other valuable veterans and should be able to make a real push for a CCC title as well as a regional championship. Florida was bested by Georgia Tech in semifinals at Regionals a season ago, and for the moment those two look to be the top two teams in the region. It would not be surprising to see the two square off in the final on Sunday in what could be a preview of a game-to-go at Regionals in 2017. The Georgia program is in a similar state to that of their pool leaders Florida State, albeit a bit further removed from success. The team’s core has been decimated over the last few seasons — the losses of Caroline Marsh, Hope Blackshear, and Michelle Yang will certainly be felt this year. The team is now relying on back-to-back years of big rookie classes and the early signs are promising for those newcomers, especially with a handful of talented veterans that they can lean on. Captains Erin Chun, Gracie White, and Mary Virginia Hahn are all strong players. They will need some of their younger core to step up if they want to make real noise in the region again, though. Alex Fairley, Samia McEachin and Courtnie Vickery are the likeliest of the current group of second years to make that breakthrough. If they do, and the team gets a couple of first year players to produce as well, then Georgia could potentially leap UCF and insert themselves into the regional picture. Georgia, perhaps more so than any other team, has a lot to find out about themselves this weekend. A semis run and a tough game with a finalist or two could go a long way in showing whether this team is ready to be back among the top teams in the region or if they’re still a year or two away. Georgia Tech enters CCC as the overall two seed, but the highest ranked team in the Southeast. Wreck loses Callahan nominee Julia Ting — and she is a big loss — but the team brings back as many important contributors as any team in the region. Ashley Brown will be one of the most dangerous handlers in the Southeast this season. She was already a strong player for Tech last year before spending the summer with Atlanta Ozone. Brown’s top targets will be Taylor Hartman, an impressive veteran deep cutter, and potential breakout candidate Dana Rose. Hartman will be one of the top downfield weapons in the region and the tandem she forms with Brown could carry Georgia Tech all the way to a regional championship. Rose is a player that has been a little more under the radar. She showed glimpses of special athletic potential but her lack of experience held her back from consistently using that athleticism to her advantage. After a summer of playing club, though, the word is that Rose has better figured out how to use her athletic ability on the ultimate field. If Rose plays up that potential, she could form possibly the most dangerous 1-2 cutter punch in Athens as well as in the region all year long. Coaches Madeleine Frey and Anna McKeen also always do an excellent job of getting contributions from their entire roster, and that depth beyond its projected leaders — bolstered by the addition of World Juniors Team USA member Ollie Peterson — should be big for Wreck again this season. Tech comes into the season as the favorite in the Southeast after an impressive run at Regionals in 2016 and the team should be in a good position to win their biggest preseason tournament this weekend. The Sirens dismantled everyone in their path at this tournament a year ago and were one of the top teams in the country all season long. But the talented foursome that led them there — Shayna Brock, Janina Freystaetter, Alexa Wood, and Eli Williams — have all departed. One of the players most expected to step up in their shoes, 2016 Southeast Freshman of the Year Sarah Gifford, is not returning to the team. UCF does have some important contributors left from last year’s team, but there is no question that expectations are significantly lower this go around. Mia Griner is the team’s best returning player, but she is not rostered for the tournament due to a foot injury. Chloe Baldino, Nicole Feldman, and Emily Hayes are the most experienced returnees, but they will be asked to carry a load that they have never been asked to carry before. The team has a number of first year players on the roster, and the program has been fortunate in the past to have some incredibly talented players come through. This tournament will be the first real glimpse to see if any of these newcomers have the ability to eventually fill in those shoes. Whether the potential is there or not, this is definitely a rebuilding year for the program. Joe Tilley is one of the top coaches in the game, but he certainly has his work cut out for him with such an inexperienced group. This weekend has to be viewed as a learning experience for these Sirens, especially without Griner available. Seeds six through eleven are made up of teams that don’t quite seem ready to shake up the region just yet, as well as a couple of teams from the Atlantic Coast in Virginia Tech and South Carolina. Of that group, Auburn probably has the best shot of upsetting the apple cart. Kristine Fedorenko is one of better throwing threats in the region and if another couple of pieces emerge for them, then they could conceivably challenge some of the tops teams this weekend and in the spring as well. It is just a preseason tournament, but this year’s CCC feels like it well set the tone for the whole season for the Southeast. Prior to this weekend, perceptions of teams were based on rosters and rumors, but this weekend will give a tangible glimpse into how teams will look in game action. The Southeast is unlikely to be a multi-bid region in 2017, but that doesn’t mean that it will be without intrigue. More than a couple teams will feel like they have shot at making a trip to the big dance, and several teams teams have the opportunity to put together a program-defining season. Whether that be a team like Georgia Tech making their first trip to Nationals, or Florida State or Florida returning, or even a team like Auburn or Emory making some real noise within the region, the Southeast is as open rich with potential stories as ever. CCC will be the first look into that. Comments on "Classic City Classic 2016: Tournament Preview (Women’s)"